I’m not really a chips and salsa person. I’m a whatever vehicle most effectively shovels the salsa into my mouth and salsa person, particularly when Fresh Cherry Salsa is up for grabs. I have a fixation for flavors and textures that do a dance-off: sweet and salty (ahem, Salted Brown Butter Churro Crispy Treats); creamy and crunchy (Plum Crunch Steel Cut Oats anyone? ); spicy and fruity (Chipotle Grapefruit Margaritas, please!). Fresh Cherry Salsa is a can’t-stop-won’t-stop boogie between burstingly sweet summer cherries, zippy lime, and kickin’ jalapeno. We’re talking chunky, fruity, and fresh. While a large spoon did the cleanest job delivering the Fresh Cherry Salsa straight into my waiting pie hole, we’ve also been enjoying it with blue corn tortilla chips (is it just me or do the blue ones taste better? ), over simply roasted chicken breasts, and I suspect that it would be irresistible atop grilled salmon or pork too. Before we go any farther, a public service announcement: You need (and deserve) a cherry pitter! I bought this one, and my quality of summer life has increased significantly since. Cherries come but once a year, so let nothing hold you back from purchasing an outrageous quantity and eating them as quickly as possible. In addition to Fresh Cherry Salsa, you can use that pitter to make this outrageously easy and delectable Double Crust Cherry Crisp, and (since it doubles as an olive pitter) a dirty olive martini. When you do, please call me. Whether by chip, by chicken, or by bare hands, Fresh Cherry Salsa is begging to be devoured before this summer comes to an end. Leave the jarred stuff aside for a night and upgrade to this spicy, sweet, and tangy treat. 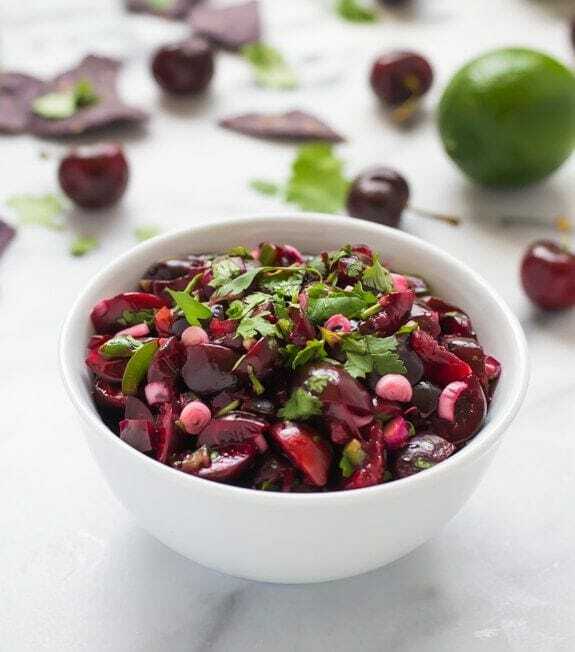 This cherry salsa recipe is fresh, fruity, and tastes incredible! Serve with chicken, pork, and of course tortilla chips. The perfect way to use fresh cherries. Find the full recipe on the Imperial Sugar website — where I am happy to be sharing it. Thank you! Imperial Sugar compensated me for my time to create this recipe and post. As always, all opinions are my own. Thanks for supporting the brands who support The Law Student’s Wife! Totally agree that tortilla chips are just vehicles. Using a spoon is my favorite! And, I was just telling someone about a cherry pitter and they didn’t understand the necessity. The best way I could explain it was that it allowed you to eat cherries rapid fire. And they call themselves cherry fans…ha! And now I am totally intrigued by the idea of watermelon salsa! That sounds delicious. Thanks Kristen! I love to eat salsa with a large tablespoon! This looks fantastic, Erin. You are a lady after my own heart Angie! Thank you so much. 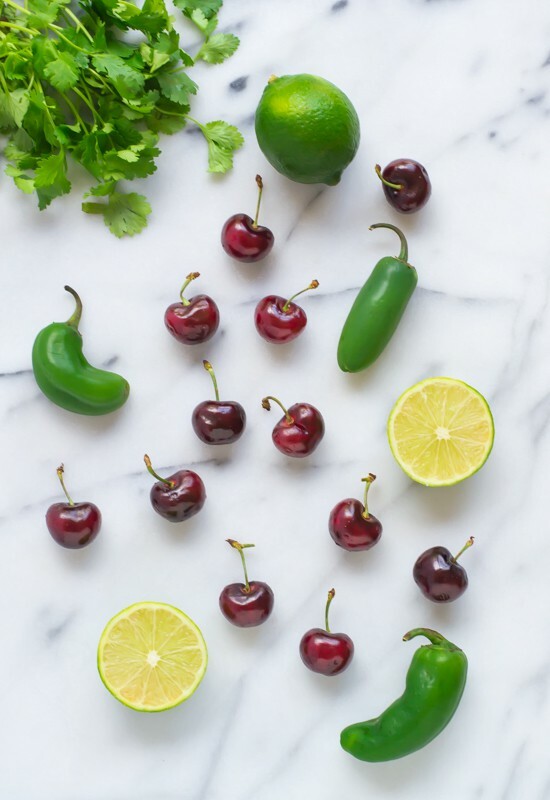 Erin – this is brilliant – I love your idea of combining jalapenos, cherries, lime and red wine vinegar! I could eat this by the bucketful! I nearly did Shashi! Thank you so much! Julie, I am so excited you said that, because I think they are ADORABLE! Also I spent a ridiculous amount of timing picking them out at the store because, you know, #foodblogproblems. Happy to link up–your scones look fabulous! Blue tortilla chips are the best! And now I need to go get both a bag of those chips and more cherries! This looks so good! I think the blue color gives them some kind of extra magic! I get nervous when we get down to half a bag and have to stock up. This looks so perfect for summer. My mouth is watering! Hi Erin, congratulations on being one of the Imperial Sugar contributors, great recipe! Thank you so much Cheri! Imperial has been such a great company to work with, and I’m so glad that you like the recipe too. Wow, congrats girl, that’s awesome about Imperial Sugar. And this recipe looks so fantastic, totally genius! 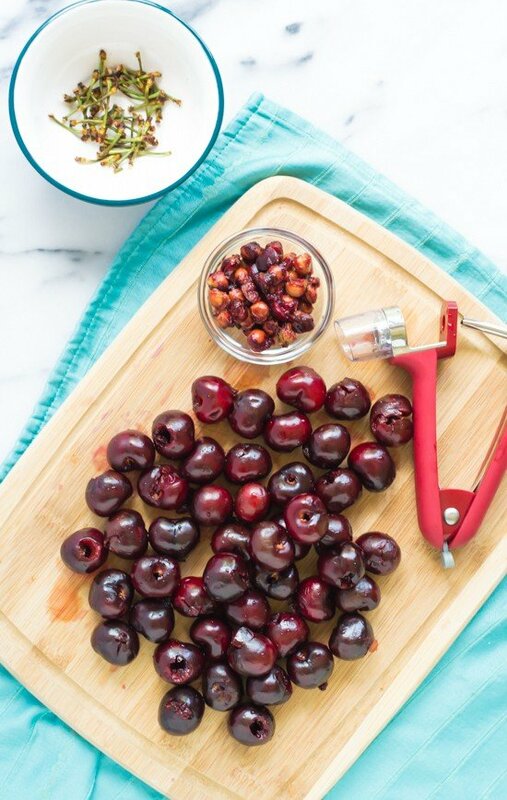 I never thought much about using a cherry/olive pitter. Good idea! Do you think this recipe would work with, say, 1/2 teaspoon of sugar? Oh yeah, I guess that might defeat the point, hehe! I’m a salsa girl through and through – sweet, spicy, chunky, thin, any and all kinds. Except that I’ve never even thought of cherry salsa, let alone seen it. Girl, this is genius! Love it! Anything with lime and fruit! Who needs the tortilla chips? This looks amazing on its own! And I love the pitter. Happiness is having good kitchen gadgets! I am in hog heaven with all the fruit salsa recipes that are popping up AND with all the fresh fruit that is available. Its wonderful. Fruit and fruit salsa makes suh a nice companion highlighter of the other dishes being served. I love cherry season, especially when I visit Michigan. This salsa is such a great idea. Anything with cherries! What a great idea. I think I would have a hard time keeping them out of my mouth while making this though. Michelle, I have to buy extra cherries for that very reason! What a great combination of flavors!! I bet it tastes delicious! I have to admit that I am a huge chips and salsa person! And, yes the blue chips definitely taste better! Since I pretty much eat chips and salsa on a daily basis, I am always looking for new and fun salsas to mix things up and I’m loving this one! I don’t think I’ve ever seen cherry salsa before, but I need some right now! Such stunning photos in this post Erin! Ah, that dark purple and green combo is hard to beat. Now, let’s talk salsa. I normally balk at the idea of eating the normal kinda salsas at Mexican restaurants. This one though? Gorgeous. I love the sweet, juicy and hot thing you’ve got going on! Beautiful! Holy Bajinkas…. This is amazing. 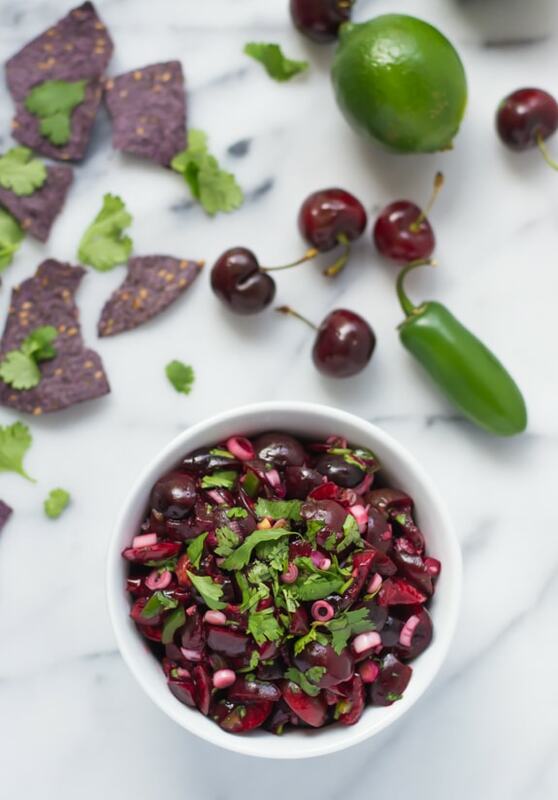 I would never have thought to make a cherry salsa, mostly because I am to busy stuffing my face with the cherries to actually prepare them. LOL! Totes pinning this for cherry season. Yum!